— Select a Brittle layout, preferably Rust by renoir. 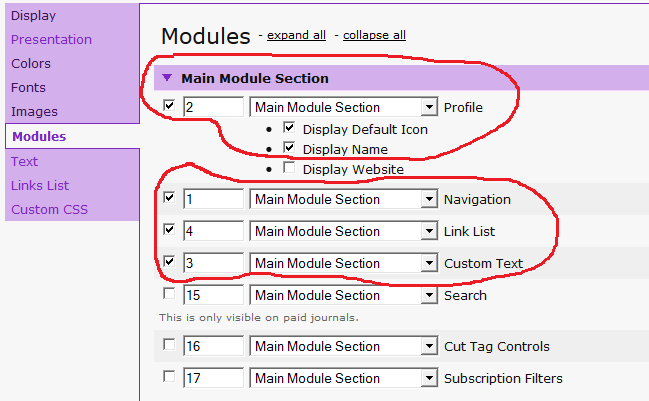 Pick 2 Columns (Sidebar on Right). — Under the Presentation tab, select text-only for entry management links. It should look like this. — Under the Modules tab, uncheck everything except for Navigation, Custom Text, Links, and Profile. Order them however you want. It should look like this. — Go to the Custom CSS tab and uncheck the Use Layout's Stylesheet(s) box. — Copy this whole thing. — Paste the code in, hit save, and you're done. — As per usual, comment pages are functional, just gross. Tested on FF and Chrome. — Feel free to edit, but do not take out the credit line from the layout code.